Government lobbyists. Who comes to mind? Probably big banks, global conglomerates and other organizations with an agenda. But what about tech companies, like Google, which spent a record $5 million in the first three months of this year alone? With recent big privacy bills like SOPA, Google clearly has a reason to outspend Microsoft, Facebook and any other major tech company. But flip through the drop down menu to compare Google against other industries, and you'll see Google's even out-lobbying large pharmaceuticals and banks. Of course, it still couldn't beat out telecom giant AT&T, which likely was lobbying for its attempted acquisition of T-Mobile. 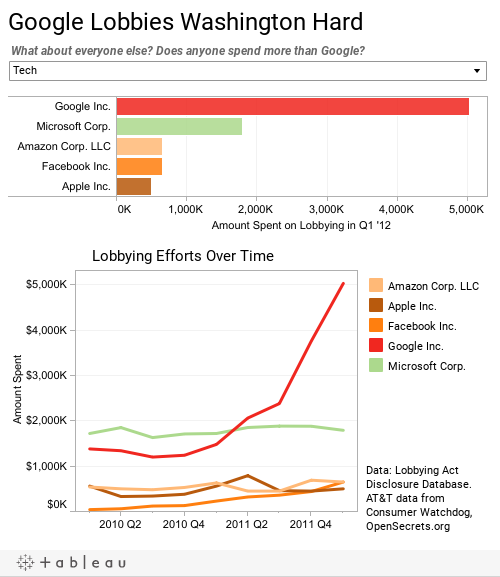 Is this the future for lobbying--where technology companies must also spend big bucks in Washington to ensure their long-term growth?